The brief is to radically increase the available storage for the 2 veterinary practice rooms whilst providing hygienic and secure furniture suitable for an animal friendly environment. Stainless steel examination tables are to be included for each room along with fitted furniture and some items of mobile furniture which are ideal for a veterinary practice. Mobile units can easily be relocated and are useful for the storage of veterinary equipment. The choice of worktop material for perimeter benching is critical. The client has selected Velstone, a smooth, easy to clean, solid surface material which is non-porous and chemically resistant. Velstone provides seamless joints and can be fabricated to provide integral radiused upstands to minimise bacteria traps. 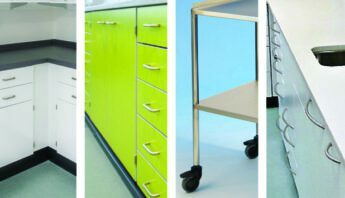 The veterinary cabinets will be made in the client’s choice of colour featuring contrasting door and drawer fronts, with locks for secure storage. The design for the new rooms includes bespoke large stainless-steel sinks and Belfast handwash sinks with infra-red wall mounted thermostatically controlled taps. If you have any queries about our veterinary furniture I would be happy to visit and discuss your brief. Please call or email or call Richard Fox on 0161 998 9726.